Out of the 1,440 minutes in a day, how many of those minutes are used to actually warm up food in your microwave? Let’s pretend that maybe you cook a quick bowl of oatmeal in the morning for 3 minutes and another 3 minutes later that night to warm up some leftovers sitting in the fridge for dinner? That’s a total of 6 minutes out of 1,440 minutes, or about 0.004% of the day. Now that we have noticed how little the microwave is used everyday, why do we keep it plugged in? The answer to that would be, for the extremely convenient digital clock that we quickly check the time as we are running late after sleeping in an extra fifteen minutes that morning or when we wake up at 3 o’clock in the morning for a midnight snack… This digital clock on your microwave may be convenient, but do we really need it? 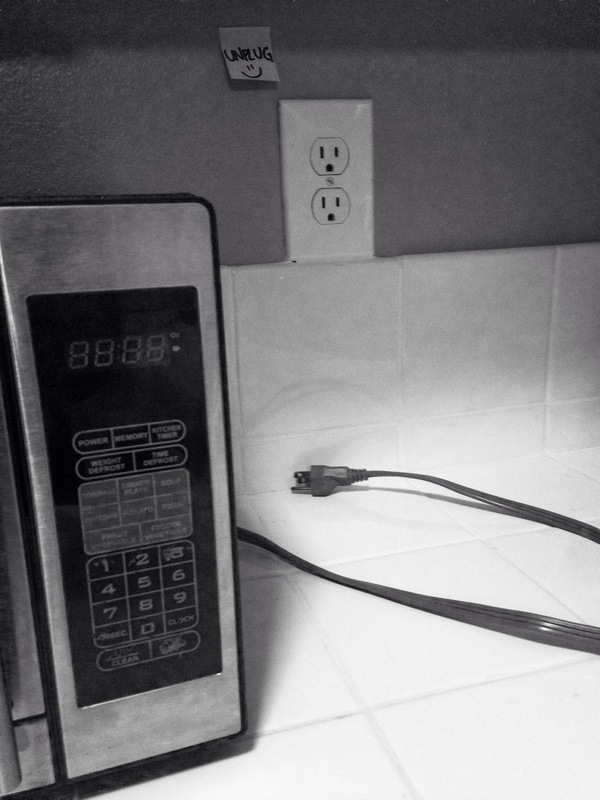 Try keeping your microwave unplugged until you need to use it for that 0.004% of the day. It may be difficult to remember to keep unplugging your microwave after you use it, so try putting a note above the plug as a friendly reminder. This will reduce your energy consumption as well as reduce your energy bills. It may not seem like a lot to just simply unplug your microwave, but in one year you will prevent over half a million minutes of energy to be consumed by your little microwave. Time... We all wish we could have a little more of it in our busy lives especially when it comes to cooking a quick meal. With a full schedule, a satisfying meal could be as simple as making a pasta dish. Packaged uncooked pasta takes about 10 minutes to cook, however what takes the longest is boiling the water. One way to speed up the process is to boil the pot of water with the lid on. This will trap the heat in the pot instead of releasing it into the air. Therefore, the water in the pot will be heated more and come to a boil much quicker. This is beneficial because, not only are you saving time boiling the pot of water, you are saving the extra electricity or gas you would have used if the lid was not on the pot. This will save you money since you will not be using and paying for an unused amount of energy. This will also help the environment because fewer energy resources were produced and consumed, which will reduce its environmental damage. Well folks, another year… another holiday season! As we plan our parties with friends and gatherings with family, we begin to realize… “My goodness this is a lot of work!” On top of the usual holiday stressors of determining the number of guests entering your humble abode or deciding on that perfect menu to “WOW!” your guests, figuring out how to “green” your holiday party is typically not on the top of your list. That’s where Be EGOlogical comes in. There are a variety of ways your holiday party can reduce its environmental impact that can cause you to go extremely out of your way, potentially remove your guests from their comfort zone, and become costly. Hosting a holiday party is difficult to run and maintain with little, or zero impact. Therefore, it is all about the small steps you can take that add up to a fabulous, yet green…er holiday party. Keep track of who has RSVP’d to your party so you can prepare just the right amount of food. Having too little could be disastrous and having too much would be a waste of Earth’s natural fuel. As your guests arrive, turn down the thermostat and let your guests’ body heat naturally warm the room. This will reduce your electric and/or gas bill. 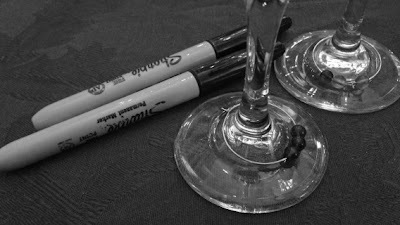 There are two necessities for your holiday party that you cannot forget: 1) A permanent marker, and 2) Wine charms. Wherever drinks are being served, ask guests to write their names on their disposable cup with the permanent marker and use wine charms on wine/champagne glasses. This will eliminate the use of extra cups or washing extra glasses because a guest forgets where they set their drink and need a new one. Reuse holiday decorations from previous years. It is an extra cost of time and money to buy new decorations for this year’s holiday party. That way you won’t have to worry about buying new items that will most likely sit in house for years and eventually end up in a landfill. Since many new holiday decorations are made of plastic and metal, it would take thousands of years for an inflatable snowman to decompose. Avoid buying poinsettia plants. The American culture associates poinsettia plants with the holiday season and are often used as decorations or given as gifts. Each holiday season millions of poinsettia plants are purchased and are thrown away. This uses up a large amount of resources to grow, package, and transport the plants to the consumer, who will throw it out when the holidays are over. You will save money and resources by not buying them as decorations and/or gifts this holiday season. Hope your holiday party will now be green…er than it would have originally been. Just keep in mind that every little effort counts and adds up to one big change! Wishing you a happy holiday season and a Green…er New Year! In today’s modern society, people tend to live exceptionally busy lifestyles. Innovations in technology have found ways to make everyday tasks more convenient and save some precious time. One of those innovations was invention of pre-packaged bagged salads. Bagged salads contain chopped lettuce leaves that are washed in chlorine. In order to keep the leaves fresh, they are packaged in an airtight plastic bag. These processes cause the leaves to lose their antioxidant nutrients and also cause a need for excess energy. The amount of energy used to manufacture bagged salads causes pollution during energy production and consumption, therefore polluting the environment and accelerating climate change. Instead of grabbing a pre-packaged bagged salad at the grocery store, buy fresh lettuce heads and create a unique salad of your own. Yes, it may take you a few extra minutes… but the rewards are worth it. You are obtaining more nutrients, saving money since lettuce heads a significantly cheaper than bagged salads, and saving the environment all at the same time! It happens quite often throughout your home; juice spills on the kitchen counter, bathroom gunk build up, bacon grease stuck on the stove … Surfaces are difficult to keep clean and are often subject to being cleaned off using various disinfectant products. Many disinfectant products are made of toxic chemicals that are hazardous to our health and the environment. Sprays can harm our respiratory health and pollute the air and other cleaners can seep into our groundwater causing harm to the local environment. There are alternatives that are more environmentally friendly and save you some money. Vinegar, lemon juice, and baking soda are cheap alternatives and are extremely effective cleaners. You can also try different lines of green cleaners sold in the store right near the “normal” cleaning products that are usually the same or cheaper in price. One line of green cleaning product is JAWS. JAWS stands for “Just Add Water System” and what makes these cleaners so special is that they are non-toxic, come in an empty spray bottle, and are reusable. The empty spray bottle can be reused once the JAWS cleaner is used up by simply buying a cartridge refill and refilling the bottle with water. This reduces the amount of plastic being produced and thrown away into the landfills and as well as reduce the amount of CO2 emitted during the production and transportation of more product. It will also prevent you from spending excess money on more cleaners, when you can cheaply and conveniently refill the JAWS cleaners. Visit jawscleans.com to learn more about where or how you can try JAWS. Who knew cleaning that bacon grease off your stove could be so EGOlogical? When cooking large hot meals, it can often lead to having left overs for another time. After consuming your hot meal before storing it, make sure you stay away from using plastic bags and keep food fresh in reusable containers. In order to keep your food fresh for longer periods of time, food must be stored in the refrigerator. However, don’t put your hot food container in the refrigerator right away. Let it cool down outside the refrigerator first, and then proceed to placing it inside. Above is a picture of the spaghetti and meat sauce I cooked last night that I let cool for a couple hours before storing it in the refrigerator. Whether you have 20 minutes to let it cool before you have to run somewhere else or a couple hours until you go to bed, letting your food cool prior to refrigeration will prevent your refrigerator’s inside temperature from heating up. This will reduce the amount of energy your refrigerator consumes in order to keep a constant cool heat. Saving energy will reduce the amount of greenhouse gasses emitted during the production on the energy’s source and will also save you money on your electric bills. Your refrigerator and freezer take up about seven to nine percent of your energy bill. There are many ways to reduce the amount of energy used to keep your freezer cool by simply reducing the amount of warm air that enters. When warm air enters a fridge or freezer space, the fridge/freezer’s natural instinct is to get it back to how cold it was prior to the door being open. Therefore, it will use more energy to cool the air inside. Previous Be EGOlogical tip: “Hunger + ? = Bad” recommended avoiding leaving the fridge/freezer door open for a long time to reduce the amount of warm air entering. Another way to save money on the energy costs of your fridge/freezer is to keep your freezer stocked at all times. It takes more energy to cool down empty air space because when your freezer is full, there is less room for warm air to enter. Therefore less energy will be used to cool down your freezer. If your freezer is not full of food, you can fill the empty space with cardboard boxes full of newspaper or frozen water bottles. By keeping your freezer full, your will reduce the amount of energy your fridge/freezer uses and therefore reduce the amount of greenhouse gases emitted during energy production and save some money on your energy bill. How many times have you fiddled with the settings of your washing machine and wondered if you are applying the right settings for each load of laundry? Every washing machine is different and can often times be confusing. Once you set it for the right size and type for the clothing you are washing, another option listed is the water temperature. You might have heard that washing your clothes on warm/hot water will “kill the germs better” or “clean your clothes better,” however this is typically not the case. Most clothes do not need to be cleaned with hot water and can get the job done with cold water. By reducing the temperature of water used, you reduce the amount of energy used to wash that load. This will reduce the amount of greenhouse gases emitted during energy production and consumption and will also save you money on your energy bill. Another added bonus is that your clothes will last longer, therefore reducing your clothing consumption rates. So next time you are about to run a load of laundry, make sure your water temperature is set to “Cold” to save energy, the environment, and money! As the school year is coming to an end, college students often find themselves with a lot of items they need to get rid of. Whether they are moving away permanently, for the summer, or simply want to do some spring cleaning, getting rid of items can be a hassle. From couches to mini fridges to extra pens and binders, these are all items that can be reused and do not need to be thrown away and sit in landfills. One option is to sell things on ebay or craigslist, however those can be a hassle and time consuming. Another option is to use a network called Freecycle. The Freecycle Network is a grassroots nonprofit movement to encourage people to give things away and prevent them from ending up in landfills. Membership is free and all you do is go to freecycle.org, sign up, find your community, and join your local efforts. When you have something or a bundle of items to get rid of, list your items and if members in your community want them, they will contact you for pick up. This is an easy and convenient method of cleaning out your dorm, house, or apartment. The Freecycle Network can also work the other way when you may need an item that someone in your community is getting rid of. By using the Freecycle Network, you will reduce the amount of resources extracted to produce new things as well as reduce the amount of pollution created during the production and transportation of those items. Other people can benefit from what is in essence, your garbage. You will also save money, since all items are free. And who doesn’t love free stuff? Visit freecycle.org to find out more information and sign up!